Is it safe to get a flu shot during pregnancy? The short answer is "yes, but catching influenza is more dangerous while you're expecting a baby". Here's what else you need to know. So, you're expecting a baby? During pregnancy, you'll be extra careful to live the healthiest life possible, avoiding unnecessary risks that may now also put your baby in danger. Some women — having heard that flu shots aren't suitable for children under six months old — may worry that being vaccinated against the flu during pregnancy will do more harm than good. When you're pregnant, you belong to the category of people especially vulnerable to the flu, along with the elderly, chronically ill people, and young children — because your immune system works differently when you're expecting a baby. Pregnant women are also more likely to need to be hospitalized with complications from the flu, such as pneumonia, which pose a serious risk to your baby too. Research indicates that having the flu during pregnancy may increase the risk that your baby will be born with a neural tube defect (like spina bifida), a cleft lip or palate, and cardiovascular malformations. This risk appears to be associated with fever rather than the flu itself. Because the flu is riskier during pregnancy, the Centers for Disease Control and Protection, the CDC, strongly recommend that every pregnant woman gets a flu shot — during any stage in pregnancy, as the flu season starts. Babies whose moms receive a flu shot during pregnancy were not found to be at a higher risk of premature birth or a low birth weight. Unlike influenza itself, the flu shot doesn't appear to increase the risk that your baby will be born with birth defects, a large study found. Research shows that getting a flu shot does not make miscarriage more likely. To sum it up, the flu vaccine isn't associated with any risks. It does, however, have benefits that increase your baby's safety. While getting a flu shot isn't a guarantee that you will not catch influenza anyway, those who find themselves in this situation will usually have milder symptoms that last for a short period of time, and they're at a lower risk of suffering complications that will send them to hospital. One study revealed that pregnant women who received a flu shot are 40 percent less likely to need to be hospitalized with the flu than those who didn't. What's more, when you get a flu shot, you also pass antibodies that will protect your baby from the flu before they're old enough to get their own flu shot after birth. Sign me up: What flu vaccine can I get during pregnancy? The nasal spray flu vaccine isn't suitable for pregnant women — you need the flu shot. Depending on where you live, you may be able to get it from your primary care provider, at your workplace, at a pharmacy, and even at your OBGYN's office during a prenatal checkup. Since the flu shot isn't 100 percent effective, what else can I do to prevent the flu? Practice proper hand hygiene — though you're very likely to catch the flu after contact with an infected person who sneezes or coughs around you, the virus can also survive on frequently-touched surfaces (such as doorknobs, keyboards, elevator buttons, and the like) for a while. You can reduce your risk of the flu by washing your hands after being in crowded public spaces, and avoiding touching your face before you do. Wiping down surfaces at home and in your workplace with antibacterial wipes from time to time is an additional protective step you can take. Stay away from sick people — if anyone's coughing or sneezing, don't come too close, and definitely don't shake hands, kiss, or hug. If you've got to be around sick people, consider wearing a surgical mask. 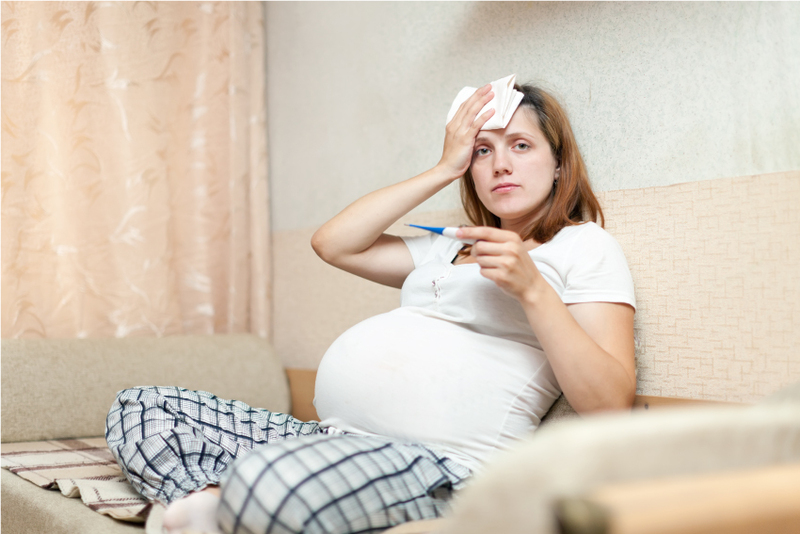 What if I get the flu while I am pregnant? If you notice the tell-tale signs of fever (not everyone with the flu has one), achy muscles, coughs, sore throat, a runny nose, and a headache, let your doctor know right away — even if you've been vaccinated. Antiviral medications like seltamivir (Tamiflu) can reduce your risk of complications and help you get better sooner. Because they're more effective in the first 48 hours after your symptoms start, it's crucial to act fast.